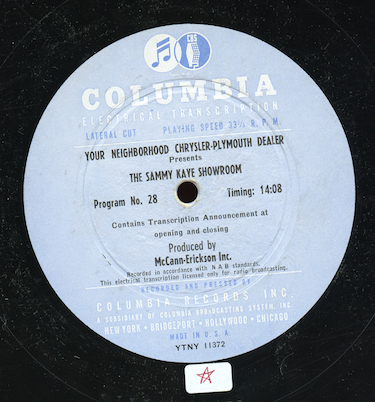 “The Sammy Kaye Showroom” was a fifteen minute syndicated music program sponsored by Chrysler-Plymouth distributed around 1949. Although at least seventy shows were produced in the series, only a handful circulate among collectors. Sammy Kaye led one of the “sweet” bands, so the show hasn’t gotten as much attention as work by other big bands and jazz performers of the period that are of more interest to jazz collectors today. The songs on program 28 include “Kiss Me Sweet”, “Louise”, “I Wonder Who’s Kissing Her Now” and a new tune Kaye had just recorded, “Belmont Boogie”. The vocals are by Laura Leslie and Tony Alamo. The Presto-Magic Fluid Drive Transmission and Chrysler service are promoted in the commercials. The show was transferred from an original sixteen inch vinyl transcription pressed by Columbia, matrix number YTNY 11372.